My opponent's arm was outstretched and, as I tried to parry an riposte, he evaded my blade. I must have been trying something fancy - perhaps advancing with a circular parry and accelerated lunge. His blade went forcefully and unerringly to the centre of my breastbone and I tried to gasp. Then I sank to my knees. My opponent was horrified. He advanced again, this time to see if I was allright. "You do have a chest protector - right?" he asked. Wrong. I didn't. I economised with the two plastic saucers which fit in pockets in the inside or my fencing jacket - and his blade had found its way through the gap between them. I've contemplated the all-in-one chest protector, just as I've contemplated proper fencing socks and a side-fastening jacket, but I've never thought myself a sufficiently serious fencer for such extravagance. The all-in-one might have been a good idea on this occasion. It had all been going so well - unexpectedly well. I began by fencing the Man man, which usually heralds an evening of disasters. I was tired too but started with my new tactic of moving backward and forward and waving my blade around while keeping the point aimed firmly at my opponent's upper sword-arm. The moving is probably a bit lumbering when compared to most of my opponents, but it makes it harder for them to judge distance. Then, if I'm lucky, they will miscalculate a hit as they move in, giving me the opportunity to land a hit while my opponent's still off-guard. I still don't win but on a good day score many more hits. The Man man wasn't used to all this movement. It must have put him off a bit (perhaps he was trying to restrain his laughter) as I achieved the first two hits in our bout, and that never happens. After that, he pulled ahead but I felt I was offering him decent opposition and the final score was 15-8. As we shook hands, he mentioned that I'd improved and was using new tactics. But being winded didn't help. Even after I'd got back to my feet and continued the bout, I was finding it hard to breathe properly. My opponent was clearly trying to avoid the area between my neck and waist so practised hitting to the leg instead. I acquired a couple of large bruises - one just above the knee on each leg. The bruise on my right leg seems reasonable - an unfortunate result of an attempt to hit from a lunge. But that bruise on my left leg - my back leg!) - shows how shambling my performance had become. I'm not sure what I was doing but plainly my stance and footwork were rubbish. 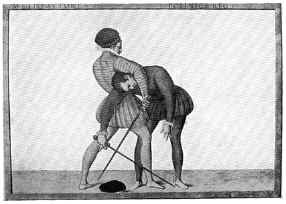 I continued fencing for a while - and tried my best against another opponent - but although I continued trying to vary my movements and change distance, I was still finding it slightly hard to breathe and the area around my breastbone continued to hurt. Of course, it was varying the distance that caused the problem, forcing an opponent who usually hits lightly to hit harder, to be sure of attaching the blade. It's still a good tactic - and my breastbone still aches.